The last time I walked into the bathroom of the house of a friend thought "needs a change in decor." If you want to contribute, the bathmat bloody feet of Regalos Oh! is what you're after. No more bland decor Scandinavian those big chains. This rug will add color to your friend's bathroom. Blood red, more specifically. True, it may not be the most appropriate mat for your parents, or someone panic when entering the bathroom. But once the first impression and after verifying that no one is hurt in the area, your visitors laugh at ease. And is that horror films, especially those billed in Hollywood, have reached a level of convention, that the scenes that happen the bathroom and not so surprised. A boy or a pretty girl enter it, music plays in keeping with the time, and someone tries to force the door. More or less, we know what will happen. Someone will die, the murderer will be caught by the end of the movie, and end resurrecting for the sequel. But not all fiction is linked to terror as trite, and the writers are squeezed brains, metaphorically speaking, to offer new insights into a genre that has a blockbuster, especially in the more youthful. While waiting for the next blockbuster we recommend you to think of this as the next mat gift for your friend more sinister. Yes, that is an expert in the history of popular serial murderers, known by heart the movie Seven, or devouring novels of Stephen King prolific suspiciously. 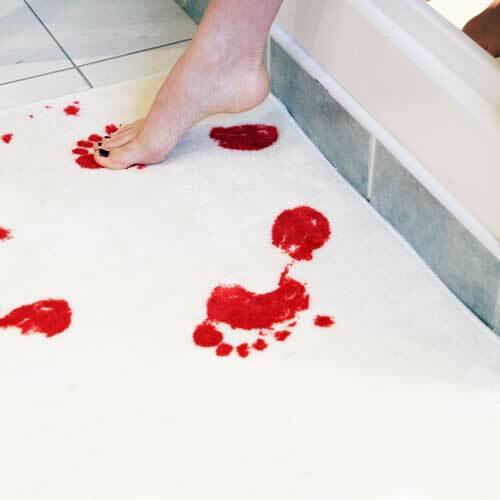 With this mat decorated with a bloodied woman feet give a different touch to your bathroom and stimulate your imagination every time you exit the shower. It can also serve to put a scare into the guests will not know quite what to think when they go into the bathroom and they encounter a custom as original. - Dimensions: 50 x 70 x 1 cm. - Bath Mat Psycho style.